Visiting Disney World On A Budget With Kids can seem truly impossible. Since we have been there more than once, with kids along, we know it is not only possible, but much easier than you expect. Yes, you will have the expenses of tickets to enter the park, but there are so many other great things you can save money on that you can easily make this happen without breaking the bank. Stay away from the park itself. One of the biggest money traps when visiting Disney World is the trap of the on site specialty hotels. While these are fun and full of extra perks, the added cost is often not worth it when you are on a strict budget. We save up rewards points to common motel and hotel chains and cash those in when available, but other options are to stay in resorts or condos in other areas of the city. The cost of transportation and parking at the park is negligible compared to the cost of an on site hotel reservation. You can easily spend $50-$75 less per night on lodging when you look at chain hotels like Marriott, Hampton Inn, Holiday Inn or even budget motels like Super 8 and Motel 6. While those lower end motels may not seem like fun, you are going to see the park, not your room. This is a sacrifice that can make the difference between going for one day or 3 days. Take your own water bottle and snacks. Pack your backpack with simple granola bars, fruit and nuts that will give you energy between meals in the park. Also grab the collapsible water bottles at your local dollar store and take in park. Water fountains are around every corner. The collapsible bottles are best since they can roll up and tuck into a pocket when empty, but can carry plenty of water when needed. Kids will want and need food throughout the day, but it is much less expensive when you have some snacks on hand for in between. Save your splurges for the specialty meals and special treats instead of between meal snacks. Extra tip: If you are going to Disney during the summer or warmer temperatures, buy a Water Misting Fan BEFORE you head to the parks. Once you are in the parks, it will be hot and you will pay anything to keep cool(in the park you will pay close to $12-$20 bucks for one). You can grab one HERE or check the local dollar stores in your area or the Florida area! Consider an annual pass. This one may strike you as odd, but if you plan to be at the park for more than a couple of days – it can actually end up being more cost effective. There are park passes that have fewer dates available at a lower rate for a season pass. These passes have black out dates for popular times, so your family would have to go only during specific days and weeks, but the savings could be considerable. If your family wants to spend more than 3 days at the park, it could easily become the best option for you overall. Extra tip: If you are planning on doing multiple parks, it’s cheaper to buy one day passes vs hopper passes! Avoid souvenirs. Our son wanted every souvenir he came across, but the price is so outrageous it just wasn’t going to happen. Instead of buying in park, pack some items and take with you to surprise your kids with each morning. The Dollar Tree actually has a great variety of treats in Disney themes that are perfect for packing and sharing. You can also shop discount retailers for costumes on the cheap so your kids can dress up while in the park, without you spending $50+ for a princess costume that is only going to be stained with punch and ice cream at the end of the day. For things like pins, buttons, magnets and key chains check the availability at local Targets or Walmarts before buying in park. You can also check the Disney Store online to see if available there. If so, you can easily watch for sales and get at a lower rate online. Visiting Disney World on a budget with kids doesn’t have to be impossible. Think outside the box and focus on what is really important about your trip. The time with your kids, their happiness and the park experience don’t have to cost your entire savings. Planning ahead can create a considerable savings that will allow you to go in park and still enjoy other great things on your vacation. When it comes to doing Disney, I believe that every child should have this experience at LEAST once in their life. I am adult, and I still LOVE going to Disney. With the boys, we saved money by many of the tips that Katie mentioned above. A few years ago we were able to score 1 day hopper passes on eBay for about $100 each. That was about a $50 savings per ticket. Disney has since changed over to the bracelets, but you can still save on park tickets. Look for ticket booths all around the Orlando area that sell discounted tickets if you do a timeshare presentation. While this may take 90 minutes of your time, you can score deep discounted tickets. Also keep in mind that Disney has cooling spots all over the park. With kids, you need that down time. Head in to a air-conditioned spot to take a nap, have the kids relax, eat a snack and take that time to recharge! 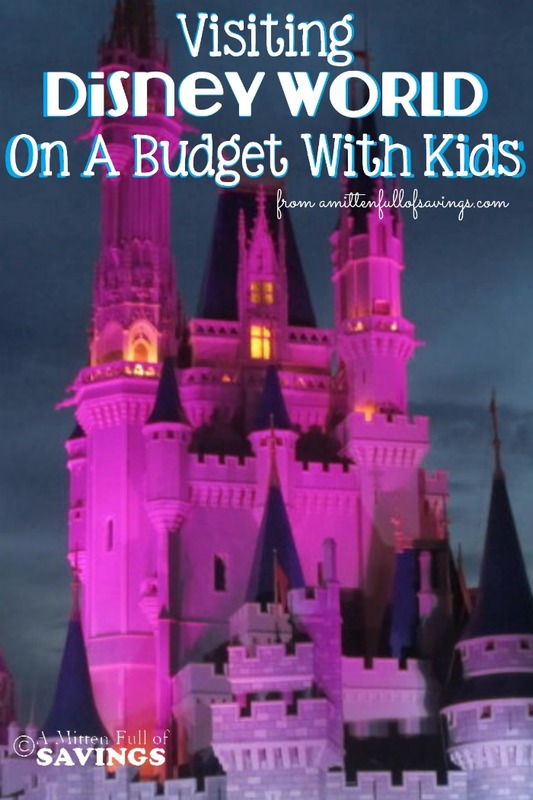 Find more tips on Disney here: 5 money savings tip for Disney! Plan your next vacation with this FREE Disney Parks planning DVD. When the kids first went to Disney, I ordered this FREE Disney DVD. The boys loved watching it and played it over and over again. It was a great way to get them into the Disney mood and to see what to expect. This was also great for my twins that are on the Autism Spectrum. They were able to see upfront of what to expect, see the characters, etc. Grab your FREE Disney Planning DVD HERE. Have you been to Disney? What are some of your favorite ways to save when it comes to doing Disney World? Leave me a comment below and let me know! Great tips! We live near Disneyland in California and when our kids were small, we used many of these same ideas. I boughts Disney stuff other places and then could buy one small thing in the park, sometimes just a smashed penny or a postcard. I took lots of pictures with characters and then put them together in an album for them to look at when we were home. We also took out own snacks (still do!). You can also go into any food place and get a free cup of water when it is hot. Thanks for sharing these! I am visiting from Idea Box Thursday today.